Bharatpur, Dholpur Jat community will get OBC reservation benefit now. Union Cabinet cleared reservation for the Jat community under the other backward castes quota. According to sources Rashtriya Lok Dal (RLD) chief Ajit Singh was keen to clear reservation for Jats. 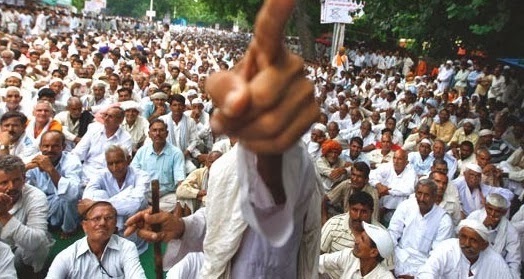 The Congress had, however, dismissed reports that the Centre was trying to woo Jats ahead of the Lok Sabha elections. Information and Broadcasting Minister Manish Tewari had said, "Not everything can be seen through the lens of election. This demand has been long pending which Cabinet has accepted." Ahead of Lok Sabha polls, the government decided to include the Jat community in the central list of OBCs in nine states, a move that is expected to benefit about nine crore people from the community. The decision would pave the way for the community members to avail benefits of reservation in central government jobs and central education institutions as per the existing norms. The Central list of OBCs for the states of Bihar, Gujarat, Haryana, Himachal Pradesh, Madhya pradesh, Rajasthan, Uttarrakhand, Uttar Pradesh and the National capital territory of Delhi will include the Jat community. Ajit Singh, Vasundhara welcome Cabinet nod for Jat reservation. Rajasthan Chief Minister Vasundhara Raje said Jats all over Rajasthan were already getting the benefits of reservation in Central government jobs and educational institutions. “We had demanded inclusion of Jats from Bharatpur and Dholpur in the Central OBC list. So this is a victory for us”. Any way I will be subscribing on your feeds or even I achievement you get right of entry to persistently rapidly.